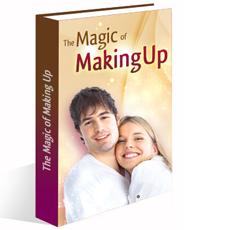 The techniques, principles and advice you will receive in the magic of making up to win back the mind, heart and soul of the one you love. 60 Day money back guarantee if not satisfied with the product. "A Brilliant Complement to the MM"
I love this guy. Seriously. I've read David Shade and De Angelo's first books (Masterful Lover and Double Your Dating), the MM, countless articles and interviews, and I really can't list all the material that I've wallowed in. Fact is, the Magic of Making Up is a BRILLIANT complement to the MM : yes it puts the accent on the not recommended u-turns... thus addressing an important question which is RARELY and perfectly explored here. But by the 20th page of one of the extra booklets, you'll get to understand that it doesn't only cover that topic : from inner game to practical approaches to self improvement, from game and seduction essentials to the true most fundamental needs of a man and a woman, as MANY corny promises you'll get back your ex you can find on the market, this is different, unique, delivers, and will enhance your game. It gets an 8/10 in my book for completion, clarity, decent style, outstanding content, and innovation.